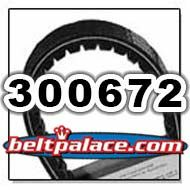 Comet 300672-C CVT BELT. TC88 Replaces Salsbury belt 704136. Comet 300672 CVT BELT (TC88) Replaces Salsbury belt 704136.